I am pleased to have this opportunity of meeting you the day after my arrival here in this beloved country, which, following in the footsteps of my predecessors, I also have come to visit. I know that here is found the secret heart of each Mexican, and I enter with soft footsteps as is fitting for one who enters the home and soul of this people; and I am deeply grateful for you having opened your doors to me. I know that by looking into the eyes of the Blessed Virgin I am able to follow the gaze of her sons and daughters who, in her, have learned to express themselves. I know that no other voice can speak so powerfully to me of the Mexican heart as the Blessed Mother can; she guards its highest aspirations and most hidden hopes; she gathers its joys and its tears. She understands its various languages and she responds with a Mother’s tenderness because these men and women are her own children. Bow down then, quietly and respectfully, towards the profound spirit of your people, go down with care and decipher its mysterious face. The present, so often mixed with dispersion and festivity, is it not for God a preparatory stage, for him who alone is fully present? Familiarity with pain and death, are they not forms of courage and pathways to hope? And the view that the world is always and uniquely in need of redemption, is this not an antidote to the proud self-sufficiency of those who think they can do without God? It is in this very world that God asks you to have a view capable of grasping that plea which cries out from the heart of your people, a plea which has its own calendar day, the Feast of crying out. This cry needs a response: God exists and is close in Jesus Christ. Only God is the reality upon which we can build, because, “God is the foundational reality, not a God who is merely imagined or hypothetical, but God with a human face” (Benedict VI, Address to CELAM, 13 May 2007). Observing your faces, the Mexican people have the right to witness the signs of those “who have seen the Lord” (cf. Jn 20:25), of those who have been with God. This is essential. Therefore, do not lose time or energy in secondary things, in gossip or intrigue, in conceited schemes of careerism, in empty plans for superiority, in unproductive groups that seek benefits or common interests. Do not allow yourselves to be dragged into gossip and slander. Introduce your priests into a right understanding of sacred ministry. For us ministers of God it is enough to have the grace to “drink the cup of the Lord”, the gift of protecting that portion of the heritage which has been entrusted to us, though we may be unskilled administrators. Let us allow the Father to assign the place he has prepared for us (Mt 20:20-28). Can we really be concerned with affairs that are not the Father’s? Away from the “Father’s affairs” (Lk 2:48-49) we lose our identity and, through our own fault, empty his grace of meaning. I am particularly concerned about those many persons who, seduced by the empty power of the world, praise illusions and embrace their macabre symbols to commercialize death in exchange for money which, in the end, “moth and rust consume” and “thieves break in and steal” (Mt 6:19). I urge you not to underestimate the moral and antisocial challenge which the drug trade represents for Mexican society as a whole, as well as for the Church. The magnitude of this phenomenon, the complexity of its causes, its immensity and its scope which devours like a metastasis, and the gravity of the violence which divides with its distorted expressions, do not allow us as Pastors of the Church to hide behind aondyne denunciations. Rather they demand of us a prophetic courage as well as a reliable and qualified pastoral plan, so that we can gradually help build that fragile network of human relationships without which all of us would be defeated from the outset in the face of such an insidious threat. Only by starting with families, by drawing close and embracing the fringes of human existence in the ravaged areas of our cities and by seeking the involvement of parish communities, schools, community institutions, political communities and institutions responsible for security, will people finally escape the raging waters that drown so many, either victims of the drug trade or those who stand before God with their hands drenched in blood, though with pockets filled with sordid money and their consciences deadened. Rediscover the wise and humble constancy that the Fathers of faith of this country passed onto successive generations with the language of divine mystery. They did this by first learning and then teaching the grammar needed to dialogue with God; a God concealed within centuries of searching and then brought close in the person of his Son Jesus Christ, who is our future and who is recognized as such by so many men and women when they behold his bloody and humiliated face. Imitate his gracious humility and his bowing down to help us. We will never comprehend sufficiently how, with the mestizo threads of our people, God has woven the face by which he is to be known. We can never be thankful enough. I ask you to show singular tenderness in the way you regard indigenous peoples and their fascinating but not infrequently decimated cultures. Mexico needs its American-Indian roots so as not to remain an unresolved enigma. The indigenous people of Mexico still await true recognition of the richness of their contribution and the fruitfulness of their presence. In this way they can inherit that identity which transforms them into a single nation and not only an identity among other identities. For others, the Church in Mexico is also regarded as being either condemned to suffer the inferior position to which it was relegated in some periods of its past, as for example when its voice was silenced and efforts were made to eradicate it; or condemned to venture into expressions of fundamentalism thus holding onto provisional certainties while forgetting to nest its heart in the Absolute and be called in Christ to unite everyone and not just a portion (cf. Lumen Gentium 1:1). On the other hand, never cease to remind your people of how powerful their ancient roots are, roots which have allowed a vibrant Christian synthesis of human, cultural and spiritual unity which was forged here. Remember that the wings of your people have spread on various occasions to rise above changing situations. Protect the memory of the long journey undertaken so far and know how to inspire the hope of attaining new heights because the future will bear a land “rich in fruit” even if it involves considerable challenges (Num 13:27-28). I invite you to give yourselves tirelessly and fearlessly to the task of evangelizing and deepening the faith by means of a mystagogical catechesis that treasures the popular religiosity of the people. Our times require pastoral attention to persons and groups who hope to encounter the living Jesus. Only the courageous personal conversion of our communities can seek, generate and nourish todays disciples of the Lord (cf. Aparecida, 226, 368, 370). Hence it is necessary for us Pastors to overcome the temptation of aloofness and clericalism, of coldness and indifference, of triumphalism and self-centredness. Guadalupe teaches us that God is known by his countenance, and that closeness and humble bowing down are more powerful than force. The first face I ask you to guard in your hearts is that of your priests. Do not leave them exposed to loneliness and abandonment, easy prey to a worldliness that devours the heart. Be attentive and learn how to read their expressions so as to rejoice with them when they feel the joy of recounting all that they have “done and taught” (Mk 6:30). Also, do not step back when they feel humiliated and can only cry because they “have denied the Lord” (cf. Lk 22:61-62), and offer your support, in communion with Christ, when one of them, disheartened, goes out with Judas into “the night” (cf. Jn 13:30). As bishops in these situations, your paternal care for your priests must never be found wanting. Encourage communion among them; seek the perfection of their gifts; involve them in great ventures, for the heart of an apostle was not made for small things. The need for familiarity abides in the heart of God. Our Lady of Guadalupe therefore asks for a casita sagrada, a “small holy home”. Our Latin American populations know well the diminutive forms of expression and use them willingly. Perhaps they need to use the diminutive forms because they would feel lost otherwise. They have adapted themselves to feeling small and have grown accustomed to living modestly. When the Church congregates in a majestic Cathedral, she should not fail to see herself as a “small home” in which her children can feel comfortable. We remain in God’s presence only when we are little ones, orphans and beggars. Only by looking at la Morenita can Mexico be understood in its entirety. And so I invite you to appreciate that the mission which the Church entrusts to you demands a vision embracing the whole. This cannot be realized in an isolated manner, but only in communion. The mission is vast, and to carry it forward requires multiple paths. I strongly reiterate my appeal to you to preserve the communion and unity that exist among you. Communion is the essential form of the Church, and the unity of her Pastors offers proof of its truth. Mexico and its vast, multifaceted Church, stand in need of bishops who are servants and custodians of that unity built on the word of God, nourished by his Body and guided by his Spirit who is the life-giving breath of the Church. Remember: the Bride knows that the beloved Pastor (cf. Song 1:7) will be found only where there are verdant pastures and crystal clear streams. She does not trust those companions of the Bridegroom who, sometimes out of laziness or inability, lead the sheep through arid lands and areas strewn with rocks. Woe to us pastors, companions of the Supreme Pastor, if we allow his Bride to wander because we have set up tents where the Bridegroom cannot be found! Brothers, may your hearts be capable of following these men and women and reaching them beyond the borders. Strengthen the communion with your brothers of the North American episcopate, so that the maternal presence of the Church can keep alive the roots of the faith of these men and women, as well as the motivation for their hope and the power of their charity. May it never happen, that, hanging up their lyres, their joys become dampened, they forget Jerusalem and are exiled from themselves (cf. Ps 136). I ask you to witness together that the Church is the custodian of a unifying vision of humanity and that she cannot consent to being reduced to a mere human “resource”. 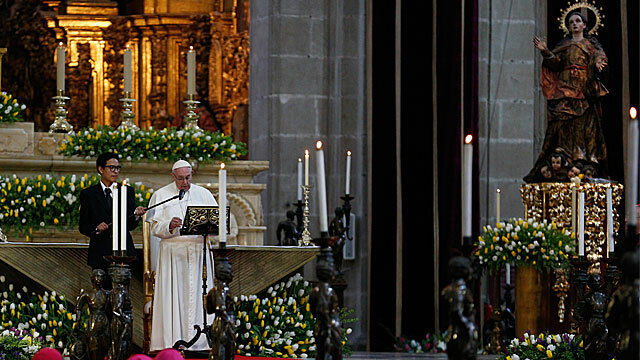 Dear brothers, the Pope is sure that Mexico and its Church will make it in time to that rendezvous with themselves, with history and with God. Perhaps some stone on the way may slow their pace and the struggle of the journey may call for rest, but nothing will make them lose sight of the destination. For how can someone arrive late when it is their mother who is waiting? Who is unable to hear within themselves that voice, ‘am I not here, I who am your Mother’?